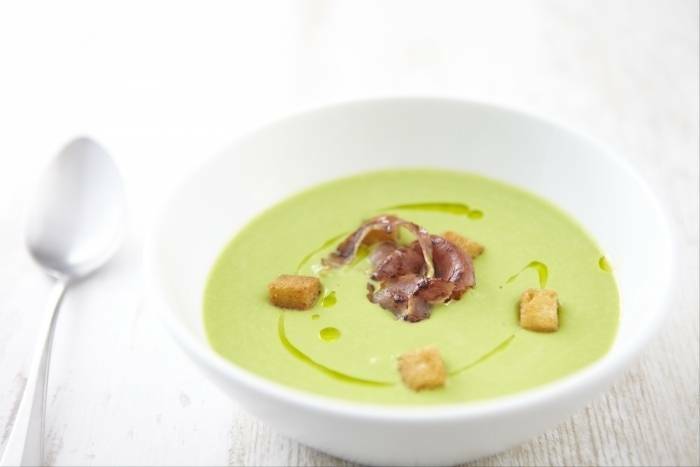 A deliciously creamy pea soup served with crisp pancetta slices and golden garlic croutons. Peel and chop the onion. Finely dice the garlic. Pick the mint leaves. Heat a splash of olive oil in a saucepan and sweat the onion for about 5 minutes until softened but not coloured. Add the garlic and cook for a minute. Add the stock and as soon as it boils add the peas. Return to the boil and cook for 3 minutes. Stir in the double cream, the mint leaves and season with salt and pepper. Blitz the soup in a food processor until smooth. Pass through a fine sieve just before serving. For the smoked bacon cubes, heat a splash of sunflower oil in a small frying pan. Fry the lardons for a few minutes until golden and crispy. Remove from the pan and place on some kitchen paper to absorb the excess oil. For the croutons, cut the bread into 1cm cubes. Peel and finely chop the garlic clove. Heat a saucepan and add the sunflower oil. Add the croutons to the pan and fry until golden brown. Add the garlic at the last moment with the butter and then remove from the pan and place on kitchen paper. Season with sea salt and black pepper. Serve the soup in a bowl. Finish with a drizzle of olive oil and a sprinkling of the lardons and the croutons.